Rajasthan Royals came up with a clinical show, to register their first win in the Indian Premier League (IPL) 3 against Kolkata Knight Riders in Ahmedabad on Saturday. After putting up a competitive 168 for seven in the stipulated 20 overs, the Royals restricted the visitors to 135 for five. The Shah Rukh Khan-owned team struggled to assert their authority on a slow-paced wicket and paid the price for leaving too much for too late. It was the first win in this edition for the team from Rajasthan and came after successive defeats in their first three matches. As regards the Knight Riders, it was their second straight defeat - after the loss against Chennai Super Kings at Kolkata on Tuesday - after they had started the campaign with a win in their opening two games. Ashok Dinda, who replaced Laxmi Ratan Shukla, made an immediate impact on the game as he picked up Michael Lumb off the very first ball of the match. Dinda bowled a perfect ball, which caught him Lumb plumb in front of the wicket. He could have had another wicket of the very next ball had umpire Rudi Koertzen not turned down a leg-before appeal against debutant Faiz Fazal. On debut, Fazal played fearless and attacking cricket, and impressed one and all with his game. In Dinda's second over, Fazal cut loose, hitting as many as three boundaries, including two off the first two balls. The batsman displayed tremendous potential in his 23-ball 31, a knock inclusive of six hits to the fence. But the introduction of Shane Bond in the fifth over earned Kolkata his wicket, as the paceman had him caught by Cheteshwar Pujara at mid-on. However, Naman Ojha (27) eased the pressure to a considerable extent by slamming three boundaries in the next over bowled by Mathews. Ojha was unfortunately run out in the ninth over and that marked the arrival of Yusuf Pathan. After a good start, couple of quick wickets, stopped the run flow for the Royals. Yusuf Pathan, who was always considered as the key to Royals posting a huge total, could only manage 15 runs and was snapped by Dinda. Abhishek Jhunjhunwala, who has been in good form in the tournament, played a quite but an impressive innings to help his team post a competitive total. Jhunjhunwala's 36-ball 45 was a perfect follow-up to his unbeaten 53 against Delhi Daredevils and gave the required consolidation to the Rajasthan innings. However, Ishant came back in his second spell to pick up Jhunjhunwala and then picked up Paras Dogra in the very same over. 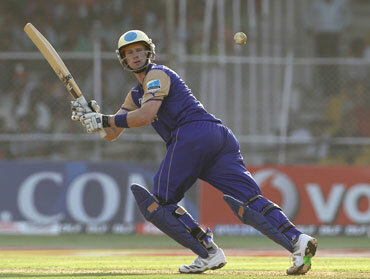 However, Adam Vogues, who came in with a big hitting reputation, stamped his authority as he provided the impetus to the Royals' innings. The Australian used the long handle to good effect towards the end scoring 37-runs off 22-balls, which included two hits to the fence and two over it. Chasing a modest total, KKR too were off to a bad start. Yusuf Pathan, who failed with the bat, shined with the ball. He opened the bowling with Shaun Tait struck in his second over, when he cleaned up Manoj Tiwari (11) with 18 runs on the board. Cheteshwar Pujara, who came in with a big reupatation, survived a close run out call off the first ball of the fourth over. However, the youngster then eased pressure a bit with a couple of boundaries off Tait, the first to square-leg and the next to backward point. Munaf Patel was introduced into the attack in the fifth over and Pujara greeted him with a couple off boundaries. The batsman was fortunate to be dropped by Jhunjhunwala (off Trivedi) when he was on 24 (in the ninth over). A steady 50-run partnership for the second wicket between Brad Hodge (36) and Pujara kept Kolkata Knight Riders in the hunt. Pujara was cleaned up by Siddharth Trivedi, while Pathan at the other end sent Badd Hodge back to the pavilion. With the batsmen struggling on a slowish pitch, KKR's hopes rested on Sourav Ganguly. But the skipper, like his predecessors struggled to time the ball. Credit to the Royals, the bowlers bowled to their field set by the captain. Ganguly especially, looked out of sorts as Royals dried up the runs. Owais Shah tried his best but couldn't match up the rising run rate, eventually falling short by 34 runs.